Have you tried Adobe Stock yet? Adobe's great stock imagery service has a lot of highlights for designers: high quality images and videos, affordable prices that include monthly and annual subscriptions, and the best: seamless integration with Adobe Creative Cloud apps. And now you can get 10 Free Images from Adobe within 30 days, with our Adobe Stock Free Trial! 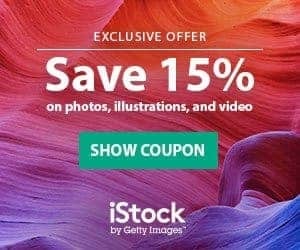 That's right: all StockPhotoSecrets readers get access to Adobe Stock's free offer for their 10 images a month, annual subscription. This plan is priced at $29.99 per month, but if you subscribe using the link below, you will get the first month for free! All Adobe images are Royalty Free, so once you download them they are yours to use forever! You never know when such a deal will be gone. Don't miss the chance, click here to get 10 Adobe Stock Photos Free today. To get into the heart of Adobe Stock and learn all the details of their service, check our full Adobe Stock Review. So, is Adobe Stock Free? Not technically, no. Adobe Stock sells Royalty Free stock photos under a paid subscription model, and they also have a credits option to buy on demand. What we are offering you here is an Adobe Stock Free Trial. This a 30-day free trial offer: You are subscribing to Adobe Stock's annual subscription for 10 images a month, yes. But for the first month, you will not be charged a single penny, and if you cancel your subscription within 30 days from the start date, you will not be charged cancellation fees either. It lets you download up to 10 images during the first month, and there's no restrictions: you can explore over 100 million top-quality photos (sourced from great stock agency Fotolia as well as direct contributions) vectors, illustrations, and 3D models, and download anything you like. These free images, just as all assets on their library, are Royalty Free: you can use them in as many projects as you want, without any time or geographic limitations, and without ever requiring to pay additional fees. Adobe Stock is seamlessly integrated into Adobe's Software Suite, and you can search with their search bar, test and license images from the collection right from your favorite design app's interface. However, you don't need to have a Creative Cloud account to use Adobe Stock, nor are you required to use any of Adobe's design software tools. 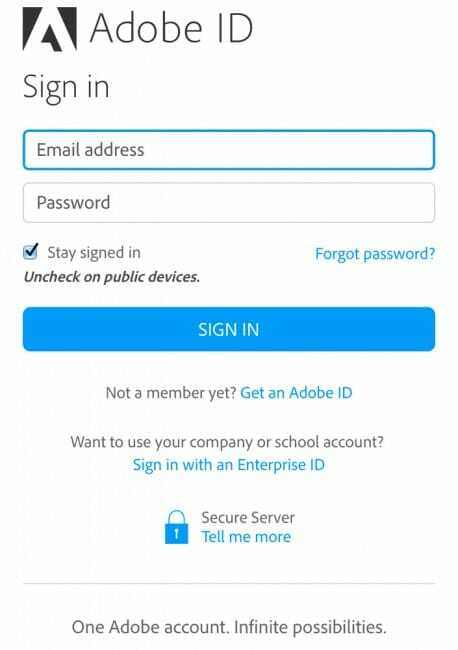 All you need is to sign up for an Adobe ID, which you can do for free. If after using your 10 free image downloads you find the value in Adobe Stock's collection and service a good fit for you, you can simply remain subscribed and you'll receive 10 new downloads every month, for $29.99 monthly. Keep in mind their credit packs start at $49,99 for 5 credits, and the smallest month-to-month plan available is for 3 downloads for $29,99 monthly, and you'll quickly realize how much you're saving with this plan. Plus the system lets you rollover unused downloads (up to 120 of them) from month to month, for as long as your plan is active, so you'll never lose on downloads. Don't forget this library's sleek integration with Photoshop CC, Illustrator CC, InDesign CC and other apps that lets you save time and effort in getting your designs done. How do I Cancel My Adobe Stock Trial? This trial, as we said, refunds you on your first month of an annual, 10 images a month plan. It is cancellable risk-free during these initial 30 days of the offer. So if you decide you don't want to continue with your plan and start paying $29,99 per month, you can simply go to your account and cancel your subscription. If you do this within the first 30 days after signing up, you will not be charged any cancellation fees. You are always allowed to cancel your plan at any time, but from the second month and on, certain administrative fees may likely apply. Keep in mind you can also upgrade your plan whenever you want, and you can purchase credit packs and subscriptions simultaneously too. This service launched in mid 2015 –following Adobe's acquisition of stock agency Fotolia— with a very strong and valuable offer for designers and creatives in a creative community, and they haven't stopped improving since: they have upgraded to include a video library, deeper integration with their platform, a Premium Collection, a Contributor Site that gives you the chance to sell your own images at Adobe Stock with a few simple clicks, and now intelligent machine learning technology to make it super easy to search and find similar images! If you're a graphic designer or creative, Adobe Images can certainly bring a lot of value to your work while simplifying your workflow. The process to get your 10 free image downloads from Adobestock is very easy. But if you are unfamiliar to it, if you don't have an account or Adobe ID, here's a quick guide to help you get started with your free account. Yes. It's that simple. You're done! Download the perfect image now! Remember that from the moment you subscribe you will get 10 image downloads for free, for one month. And you have up to 30 days from that moment to cancel your subscription if you don't want to continue to a paid, $29.99 a month annual plan. After that period you could still cancel your subscription, but you will be charged with cancellation fees. Ready to get high-quality images for free? Get your Adobe Stock Free Trial now. How do you Download Images from Adobe? Now you've got your free download account running, it's time to download some cool images! There are two ways to do it and they're both very simple. It depends on whether you are using Creative Cloud applications, or you want to work with your images using different editing software. Open your favorite image editing app like Adobe Photoshop or Adobe Premier. The download will be discounted from the ones you have available, and you can see the remaining in your account area. Why is Adobe Stock so Cool? Adobe Images is great and valuable for many reasons. But the main is that it puts a huge collection of top-quality imagery just a mouse click away from you, right into your favorite design apps. While it's true that you don't need to be a Creative Cloud user to benefit from their Stock (it has its stand-alone website and you can download the images and import them to any design software of your choice), if you use their apps you'll get the best out of this service. Adobe Images is a stock photo library that is seamlessly integrated into applications (like Photoshop, Illustrator, InDesign, Adobe Premiere, and AfterEffects). It lets you search, find, test, license and use images from the collection in your work, without ever leaving your app's layout. You can launch their collection from the app's library, use the search engine (now greatly improved) and browse the results to find the images that better suit your needs. Use their visiual search feature within their website and find the perfect images with their aesthetic filters and depth of field filters. Of course, all the downloaded images are roaylty-free stock photos and they also offer other different stock assets which can be used within their desktop apps. What's even better: you can apply a watermarked preview from any image in the collection to your design, and edit it as much as you want. If you further decide to use the image, you can download the unwatermarked, licensed version with a simple click, and through CreativeSync the system will update your design with the final version without any input from you. This means you can save a lot of time and effort in your workflow, avoiding the tedious steps of going to a stock agency website, logging in, searching for images, downloading a file and then importing it to your design software. Plus, you can show your work to your clients and get approval for your designs before actually licensing the images used, among other great advantages. 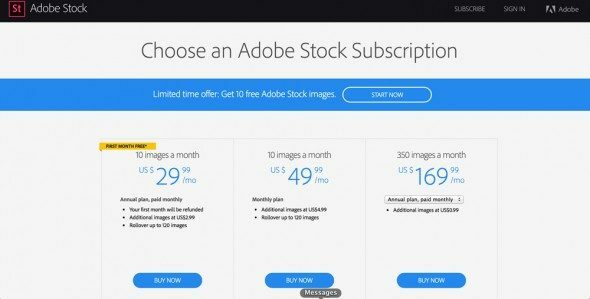 Adobe Stock pricing has various subscription options for stock images (photos, vectors, and illustrations). With subscriptions, you get a preset amount of downloads per month, for a fixed fee. They also have a credit pack offer to buy on demand, that works for assets not included in subscriptions (like Premium images or stock videos). Subscriptions start with a very small plan for just 3 downloads a month, and it's ideal if you only need so little images, or if you want to test the waters (but with our free downloads you won't need it!). Then there are larger volume options that will save you a lot of money. If you need images consistently, every month, a large volume subscription is the most suitable option. It has monthly and annual plans. In all cases, subscriptions cut a large portion of the per-image price, and annual plans offer the best deal. As you see, Adobe Stock prices and plans have options to fit most of designers and creatives' needs, and you'll surely find an offer that works for you. This is the kind of service that only gets better with time. 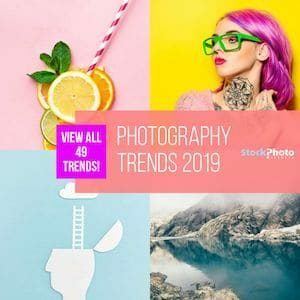 Since they launched in 2015 with a library of 40 million images from Fotolia's collection, they have performed several updates and upgrades, all full of very cool features. Not long after their launch last year they announced the addition of HD stock video to their service, plus Extended Licenses, which materialized shortly after and included a major upgrade in the service's integration with Creative Cloud, that included team accounts to collaborate with your team of designers. A little way down the road they also added 4K stock footage to the video collection, which for now only sells on-demand. Their image collection now has over 60 Million assets and keeps growing. Some of the latest developments are very exciting. They have launched a new Contributor Site that enables you to submit your own work to be sold at directly –previously you could only contribute via Fotolia–, using Lightroom and Bridge. They've also introduced computer vision and machine learning technology, that are the base of the new reverse image search and sketching image search features. They presented all these innovations in a press conference at Photokina 2016, which you can watch here. And I also had a chat with Zeke Koch, Sr. Product Manager at Adobe Stock, where he shared details of their core features and some exciting plans for the future. You can check my interview with Zeke here. They really offer their customers a lot of value for their money, and it all indicates they'll continue striving to deliver the best possible stock imagery service. If you want to test this by yourself, get your Adobe Stock Free Trial now! Related: Adobe Stock or Fotolia? If you ever used Fotolia's services –the stock agency acquired by Adobe that is at the backbone of Adobe Stock–, you'll know it's one of the best credit-based agencies (meaning they sell images with credit packs that you buy on demand and use whenever you want). So now you might be wondering, is Adobe Stock better than Fotolia? In which case is more convenient to use one or the other? The answer to these questions is in our dedicated Fotolia vs. Adobe Stock comparative review. Check it out! Now you know the reasons why Adobe Stock is so valuable, it's only a matter of knowing if it'd be valuable to you. And the only way to know that for sure, is through experience. Fortunately, now you don't have to spend money to try and see how well it meets your stock photo needs. You can try for Free for one month, and download up to 10 high quality stock images, completely free. What are you waiting for? 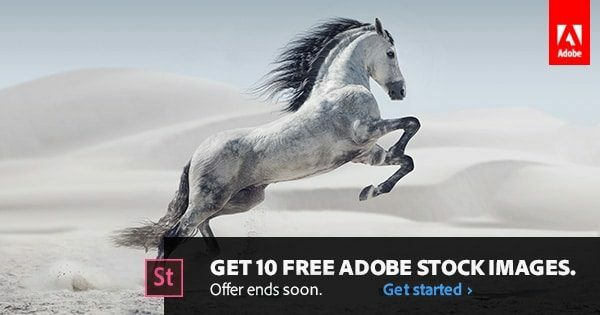 Get your Adobe Stock Free Trial started today!